Jaguar XF 163ps 2.2 Diesel launched | What Car? 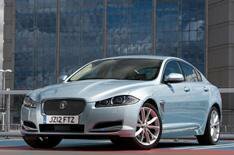 The Jaguar XF 163ps 2.2 diesel - a lower-powered version of the current 2.2-litre diesel model - is on sale now. The new entry-level Jaguar XF uses a 161bhp version of the four-cylinder, 188bhp 2.2-litre turbodiesel engine that was introduced in 2011. The new unit produces 295lb ft of torque, compared with the higher-output models 322lb ft. As with the existing XF 2.2 Diesel model, an eight-speed automatic gearbox is standard. Reducing the power lowers the XFs starting price by 1000 to 29,950, and increases the 0-62mph time from 8.5 seconds to 9.8 seconds. The benefit gained from the new engine is purely on the purchase price, because average economy and CO2 emissions are identical to those of the higher-powered version. A CO2 figure of 149g/km doesn't get near that of the cleanest BMW 5 Series, at 119g/km, and the cleanest Audi A6, at 129g/km. The new car comes with the same standard equipment as the higher-powered 2.2D SE model, including part-leather seats, a touch-screen display, climate control and a stop-start system.